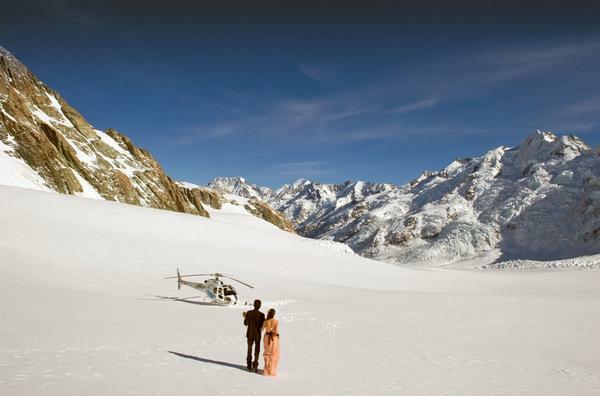 As they flew by helicopter over the rugged Southern Alps en route to their glacier wedding at 6800ft, Richard Lee and Regine Hong witnessed a glacier calving on the Tasman Glacier Terminal Lake. It was the culmination of a wedding experience that had involved staff from The Hermitage Hotel at every step of the way. Mr and Mrs Lee had originally booked their trip to New Zealand for October of this year, prior to Air Asia-X announcing their decision to withdraw their direct service to Christchurch. They were still deciding whether or not to make the journey when they met hotel Sales & Marketing Manager Cher Knights in March at the MATTA Travel Fare. Ms Knights offered to help reschedule and organise Mr and Mrs Lee’s special day right down to the last detail, but not even she could have predicted what was going to happen next. 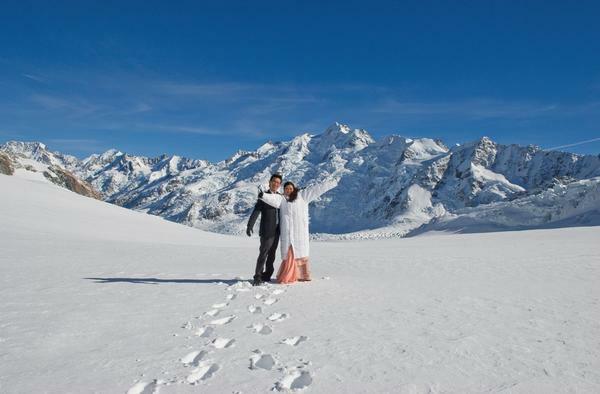 “Aoraki Mt Cook is renowned as being home to the most spectacular scenery and is the perfect setting for memorable weddings, on snow and off,” she said. 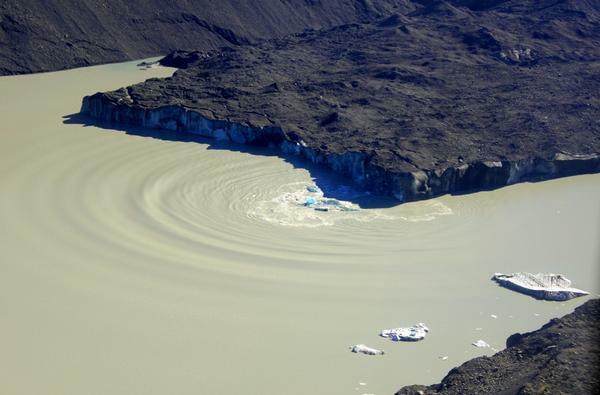 “The glacier had a massive calving just two days before, so I’m stunned they were fortunate enough to personally witness another massive iceberg calving on the way to their wedding. Mr Lee said he and his new wife felt very privileged to be part of something so incredible. “We understand we’ve experienced something very beautiful and unique,” he said. “Everyone here in New Zealand has been so happy for us that we were able to see something so special on our wedding day. Mr and Mrs Lee are travelling around New Zealand’s South Island before returning home to Malaysia later this month. They said from the moment they met Ms Knights in Malaysia right up until their big day, the staff at The Hermitage had ensured everything went smoothly. “The staff had been wonderful, accommodating and pleasant, even providing the things we didn’t think to bring,” said Mr Lee. 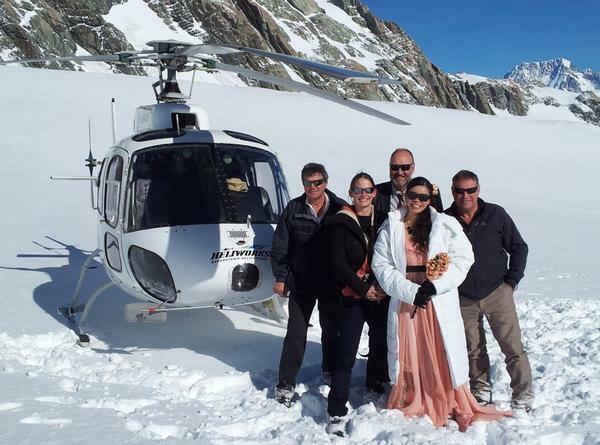 “The Conference & Wedding Coordinator Liane, borrowed things for us to use like boots and really warm socks,” he said. “We don’t normally need long woolly socks in Malaysia. “In the rush to get everything done, my wife and I actually overlooked getting our marriage paperwork sorted before our wedding day, so our wedding celebrant Denis Callesen offered us a free night’s accommodation and a delicious home-cooked dinner in his Queenstown lodge to make sure we were in the right place at the right time to get our paperwork on time. Wedding celebrant Mr Callesen said he had been living and working in the Aoraki Mt Cook area for 20 years and had never seen a calving ‘first hand’ before. At the end of their special day Mr and Mrs Lee enjoyed dinner at The Hermitage Panorama Room Restaurant as part of their wedding package. *MATTA Travel Fare is the Malaysian Association of Tour & Travel Agents.